Within the past twenty years, various architectural theorists, critics, and writers advanced “infrastructure” as a type of organizational, ecological and data-ridden glue that moves through, under and between buildings. These poets of bridges, water pipes, roadways, and data networks, write choruses to the often-overlooked systems that lace together cities and their subjects. Their work continues to inspire architectural and urban practices that work at an infrastructural scale, which is to say, practices that operate by reconstructing the bureaucratic, natural and information landscapes that transform settlements into cities. As interesting as this work is and continues to be, it was a Columbia University student of historical preservation named Michael Caratzas, whose 2005 graduate thesis made me think about infrastructure in truly new ways. 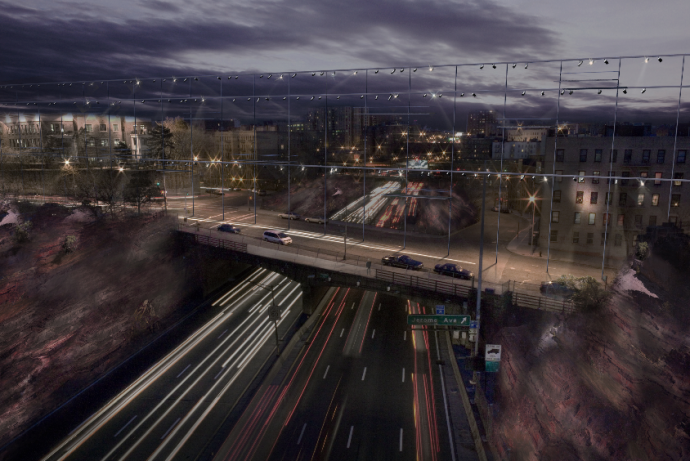 The project was a proposed “historic preservation” of the Cross-Bronx Expressway in New York City. For those not familiar with the Expressway, it was the notorious masterwork of Robert Moses and his public works force. The roadway, finished in 1955, displaced thousands and gutted several lively working-class neighborhoods in the Bronx of their most central spaces and streets. Many continue to think of this as one of the most awful roadways in New York, if not the United States. In his proposed preservation, Caratzas suggests that these types of infrastructural networks can now be viewed as historical constructs. He has developed a “historical” vision of the possible pasts that might be recovered within a network society or a network culture — ie a social sphere defined by relationships to and within networks. A preservation of the Cross-Bronx Expressways is a fascinating idea because it takes the discursive apparatus of preservation, which is often used for buildings or built landscapes, and directs it into a vast infrastructural system that is difficult to contemplate with a historical consciousness. The Cross Bronx Expressway is a stretch of highway without clear boundaries; it is filled with both a difficult beauty and the more obvious unpleasantries. Because it is a roadway, we tend to think of it as a site demanding constant upgrades. How does one simultaneously preserve and upgrade a roadway system? Perhaps more to the point, Caratzas notes that the construction of infrastructural systems generally, highways more directly, and the Cross-Bronx expressway more particularly, often destroyed historical neighborhoods and buildings. They are anti-preservation incarnate. We tend to view these mid-century highways as so suspect that they are outside of that realm we call culture. A few historians and curators recently historicized and focused upon the spatial power evident in the Cross-Bronx Expressway and Moses’ other New York City projects. Yet, we safely and nostalgically celebrate the work of people such as Moses in museum exhibitions. In this context, looking at a model, the true power and horror of what was staged can be appreciated with a historical mentality that is more pacifying than sublime. The Cross-Bronx is where Robert Moses decided to “swing the meat ax” — displacing thousands and destroying entire precincts of the City for this stretch of highway. Caratzas thesis inspired the image that accompanies this brief essay. This image is part of a series commissioned by The Nevada Museum of Art’s Center for the Environment and its guest curator, Geoff Manaugh. The exhibition — Landscape Futures — invited architects, landscape architects, artists, and historians to envision the future landscape from their particular disciplinary and theoretical vantage point. The image is part of a contribution that examines how we might think about and see historical landscapes in the future. The image, and the others in the series, depict various reconfigurations of the type of lights, vitrines, podia, stanchions, and scaffolds used to protect and visualize historical objects. This is the skein of material that surrounds something like the Dendur Room in the Metropolitan Museum of Art in Manhattan. We encounter this type of lighting when we contemplate objects and non-human life in museums or zoos, although generally unaware of its presence. This web-work of museological stuff — lights, podia, vitrines—transforms stuff into objects of our interest. Here, a museological, historicizing framework is laced into the wound created by the Cross-Bronx Expressway and the surrounding neighborhood. It reconfigures the illumination of the highway away from roadway traffic and more towards the highway as a physical totality—as something to be contemplated. It also emphasizes the landscaped residues of the project. The lights begin to announce the Cross-Bronx as a historical object, as much as an organizational network or system. This image is not an explicit call for preservation, in the manner of Caratzas thesis. However it certainly suggests the presence of a preservation mentality within this place. But more significant, and like Caratzas, it begins to suggest that it may be the curators, preservationists, and historians—and not the engineers—that begin to recuperate the United States’ infrastructure both as a thing and an idea. This in turn, transforms what we understand both infrastructure and history to be.